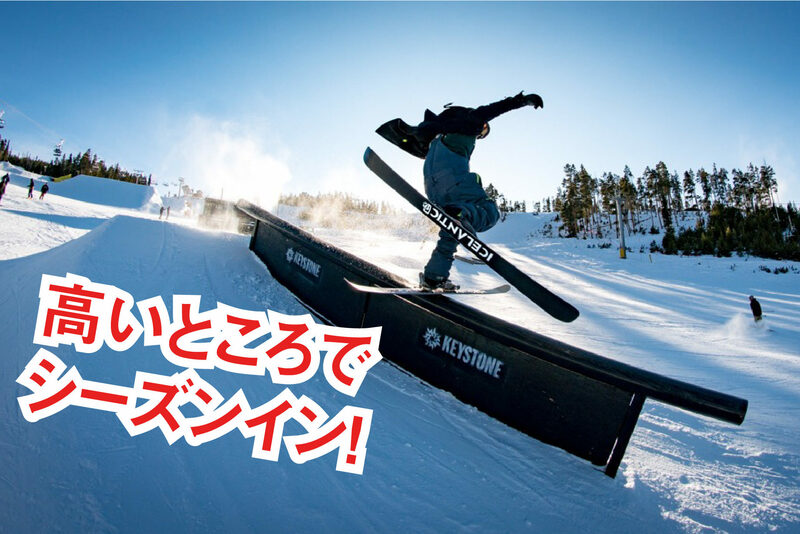 “Japow” might be the first keyword you have heard if you are willing to travel to Japan for your winter holiday. Yes, you are right, Hakuba is full of Japow (Japanese-powder snow) and that’s why many people travel to winter Japan to enjoy the magnificent view of the Japnese alps and super powdery snow. 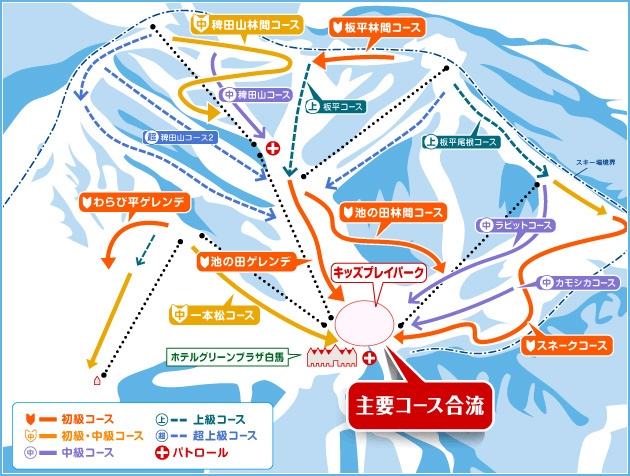 This ski area/resort information is for you, who are planning your ski/snowboard holiday destination to Hakuba; especially for first-timers and of course for repeaters as well. Japow is absolutely addicting, and that’s I’m telling you, why many people continue coming to Hakuba and become powder junkie. And I am one of them too of course. So, here you go, – here’s everything we think first-timers need to know and what we would have found helpful when planning your trip. Hakuba Valley, forms from 10 different ski areas/mountains and they all have different features. Even though all the ski resorts are called “Hakubaーーーー” it actually forms from 3 different districts; Otari Village, Hakuba Village, and Omachi City, and if you put all that in one, it is called the “Hakuba Valley”. Hakuba Valley is also now one hot destination for ones who bought Epic Pass. So better buy Epic Pass, if you are willing to travel around the world to enjoy the mountains all of the worlds during your winter holiday!! Hakuba Valley forms from 10 different areas/mountains. Where are they actually located? Here is some image of the whole valley. It might be good to know the locations especially for those who hired a car during your stay. All areas are within 30min. drive so it not like you have to drive an hour to get to another ski area. 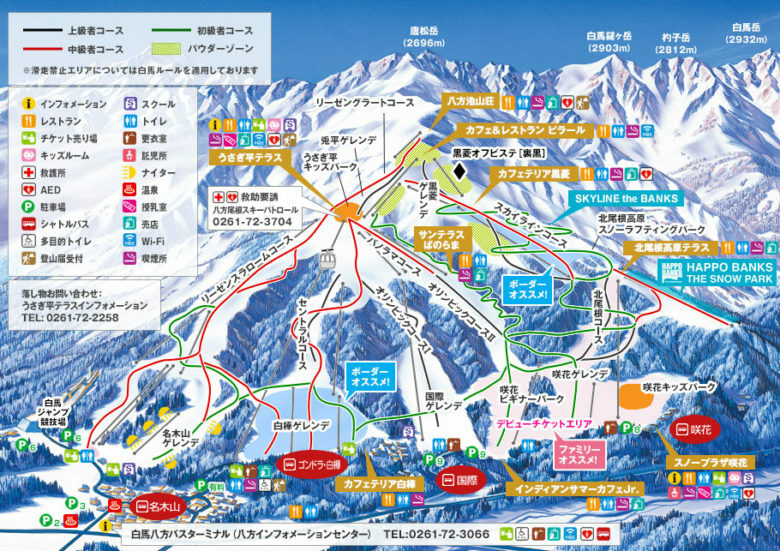 Let me introduce those locations from the northern part of Hakuba Valley. 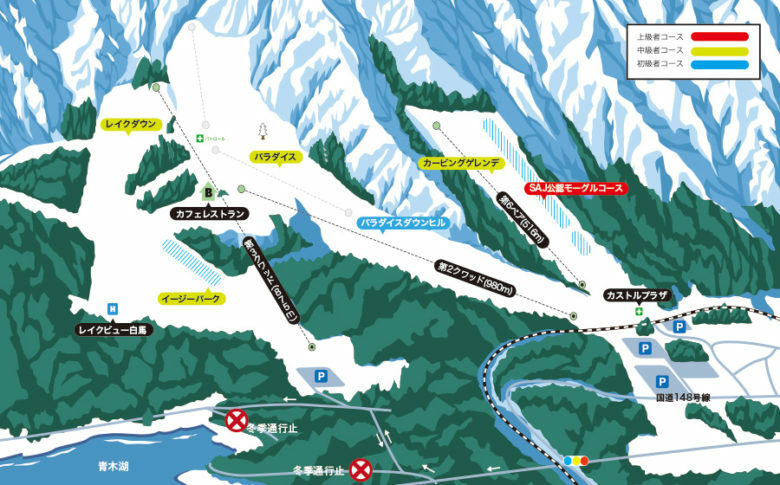 Here are some brief introductions for all of the ski areas for HAKUBA VALLEY. If you want to know more detailed information about each ski areas, you can just click on the link provided. All ski areas have an English website. It is known for its massive hotel (Hotel Green Plaza) right in front of the main slope and very convenient area for big group and families. It is one of the ski-in/ ski-out areas if you are willing to stay at Green Plaza. 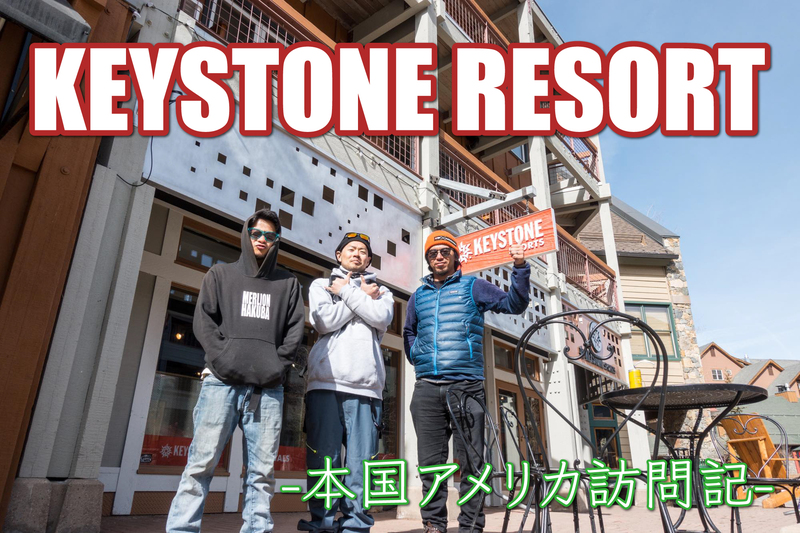 They have now opened a Side-Country area which is a great opportunity for those who want to enjoy an easy JAPOW. Most of the people will think, going back-country might be too tough…you have to buy/rent expensive gears and will need skills to enjoy 100%…but you don’t have to worry about those issues too much for this side country courses. However, you have to always keep in mind that it is SUPER DEEP and I personally will not recommend if you are a beginner to try the deep powder. 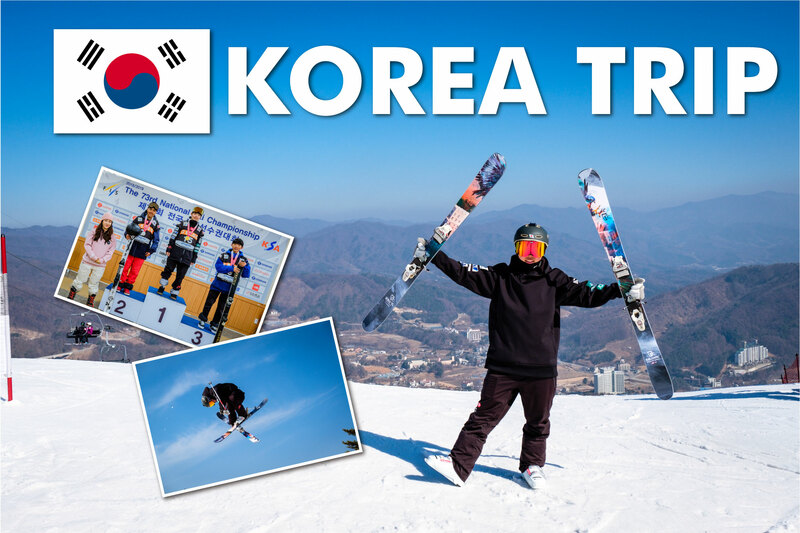 Most of the courses are facing toward the hotel, so even if you don’t know the courses well, you can still reach to the main area so low risk of getting lost in the ski area. But different story if you go off-piste. 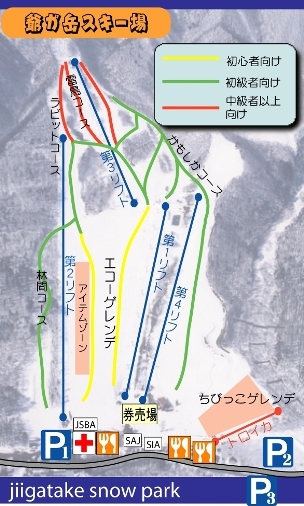 This ski area is also connected to Norikura Ski area. Access：90 min. drive from Azumino IC / Free Shuttle from JR Minami-Otari station 20 min. Same as Hakuba Cortina Ski Area, Norikura Ski Area has a massive hotel (Hakuba Alps Hotel) right in front of the main slope. The slopes here are WIDE compared to other slopes in Hakuba Valley, so for those who want to ski with wide open slope, this is where you want to be. 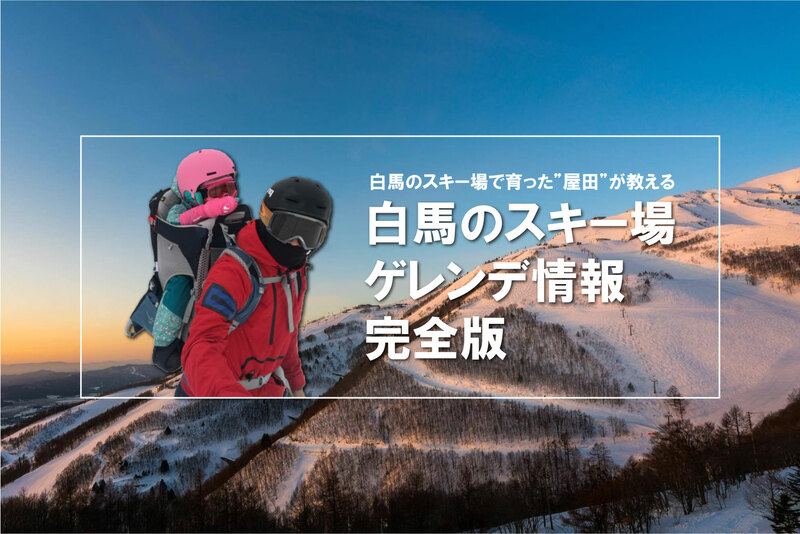 Norikura is very flexible with new items such as snow scoot/ sleds/ etc…so if you want to try your new item, might be the easiest place to start. There is an off-piste area as well so it is also great for expert skiers for tight and powdery tree runs. You can traverse to Cortina Ski area easily. Access ：90 min. drive from Azumino IC / Bus or Taxi from JR Minami-Otari Station 20 min. The largest ski area in Otari Village. There is a gondola that you have to take in order to go to the peak and it will be a super long run to the bottom of you have reached the top. If you are a powder junkie and want to hit the TSUGAPOW, you must take TSUGAPOW DBD(Double Black Diamond) course. 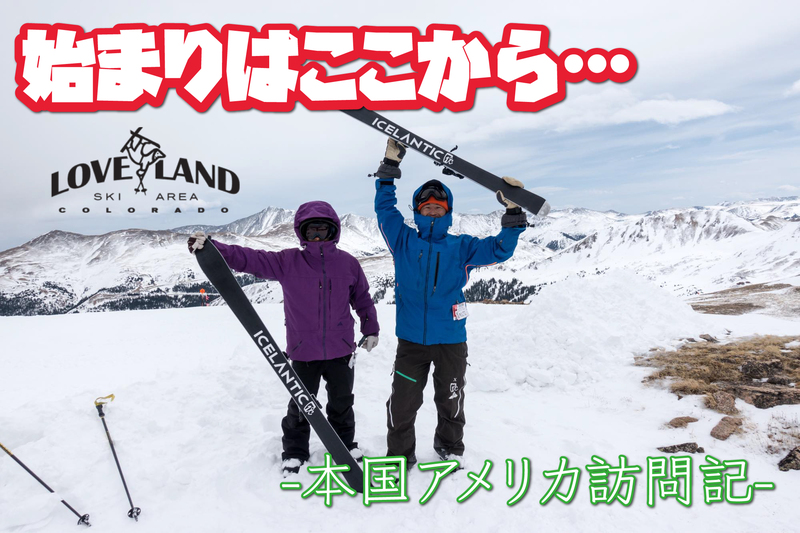 Many world famous riders love Tsugaike powder and it is a must experience if you are an expert skier. There is a great PARK area called the HIT PARK so if you are park rider, this is also a great place to be. Also, even if you are a beginner, as there a novice course that runs from the peak to the bottom, you don’t have to panic if your ski mate just takes you to the peak. Some lodges are located just next to the slopes. 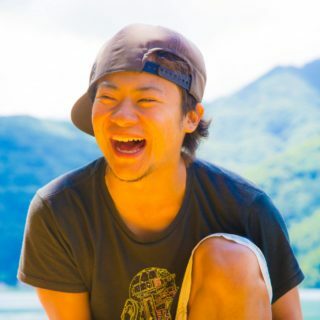 I personally love this lodge called 「Casual Lodge FREERUN 」. Great owner couple. Iwatake is known for ALL SEASON SPORTS PARK; you can do all sorts of outdoor sports throughout the year. 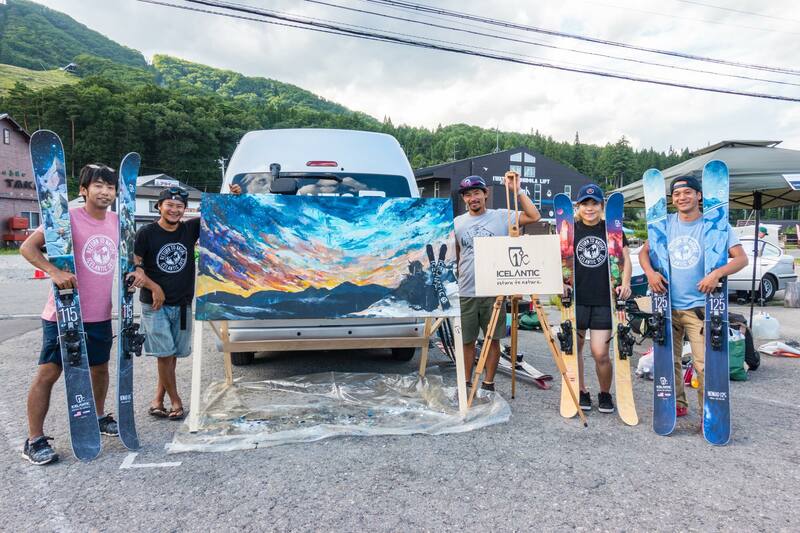 Hakuba Mountain Harbour is now open and its one of the most popular destination for tourists and of course skiers, which has City Bakery and a magnificent view of the Hakuba Three Peaks. It is also known for its dramatic view of the Japanese Alps, which you can enjoy the superb panoramic view of the whole village and the mountain range. Iwatake also has a great range of ski/snow school as well. 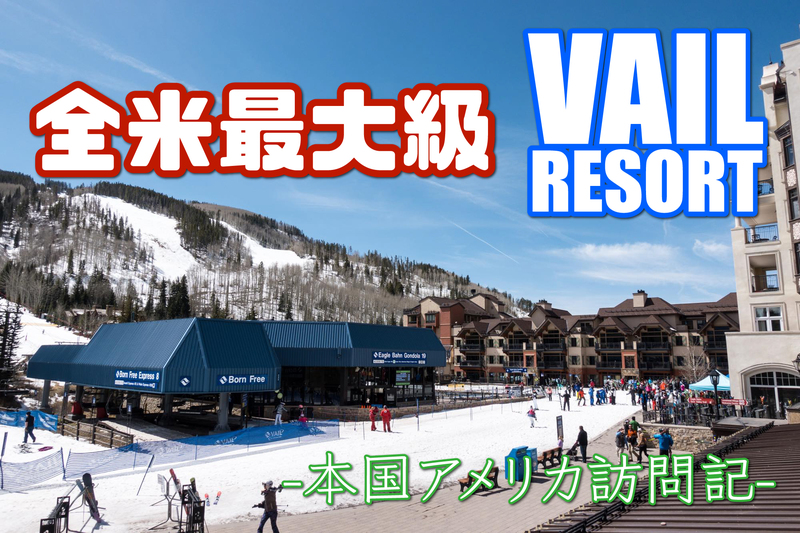 Especially for those who are from an Asian country, 「無限界滑走 國際滑雪學（CrossShred SnowSports）」provies you great Chinese/English lessons for you. 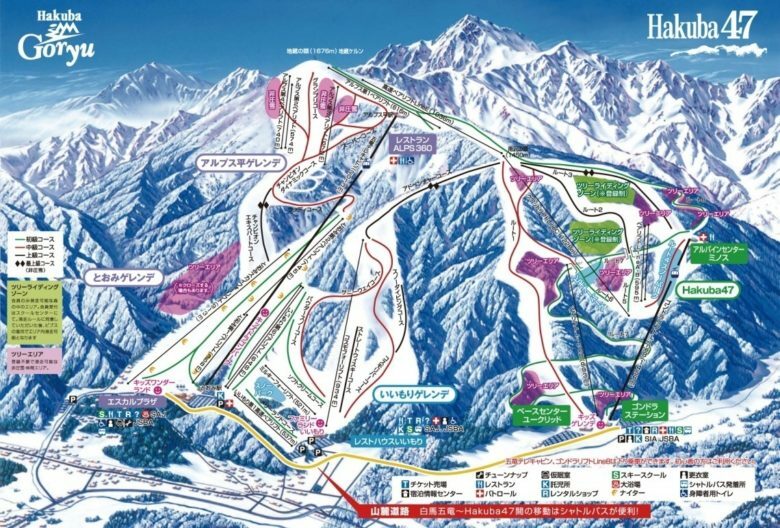 Happo One is the largest ski area in Hakuba Valley, has the longest run of 8000m from the peak to the bottom. 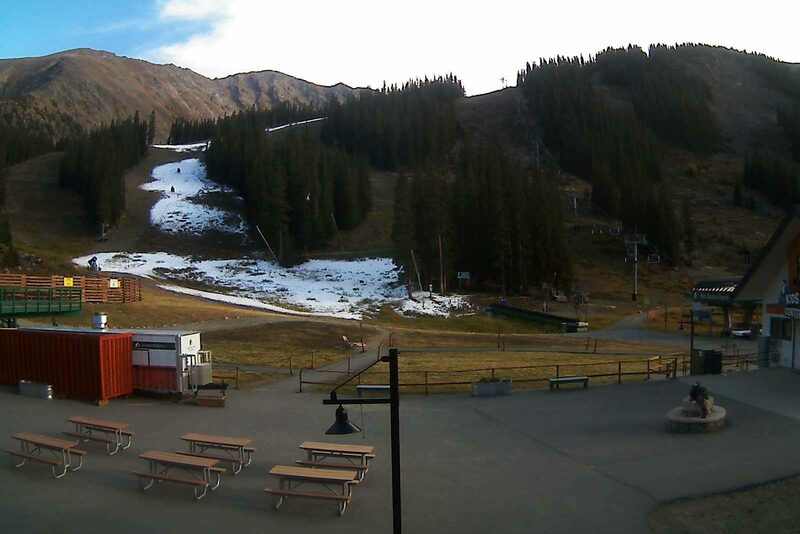 It has several ways to access this ski area so you can find your favorite lift chair/gondola to start your day. The altitude of this ski area if about 800m~1800m so the snow here is very light and powdery basically throughout the season. You can even ski in May depending on the condition. 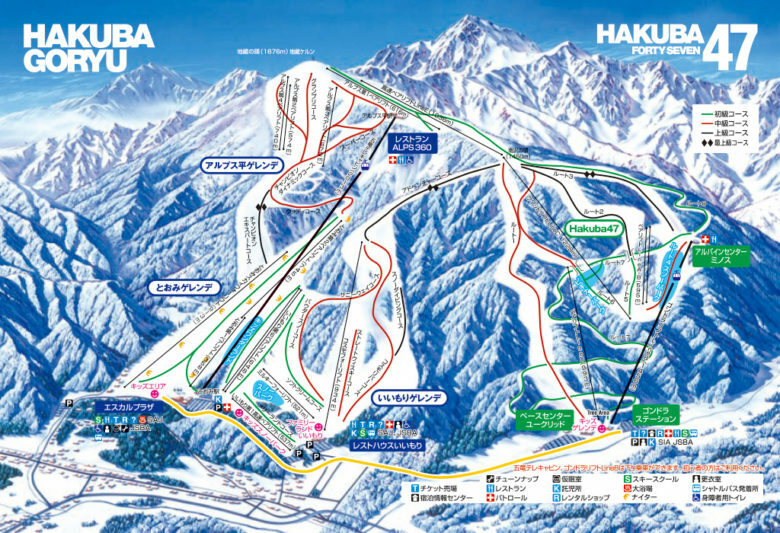 If you are looking for some park/jib/ kicker slope / and half pipe area, Hakuba 47 it is. Slopes here are pretty steep compared to other ski areas in Hakuba Valley. There is also an off-piste tree run course but you must register in advance and receive a bib to get into that area. It is connected to Able Hakuba Goryu, so you can enjoy two mountains all at once. The pizza here is absolutely amazing. Must try. Changed the official name to Able Hakuba Goryu last year. 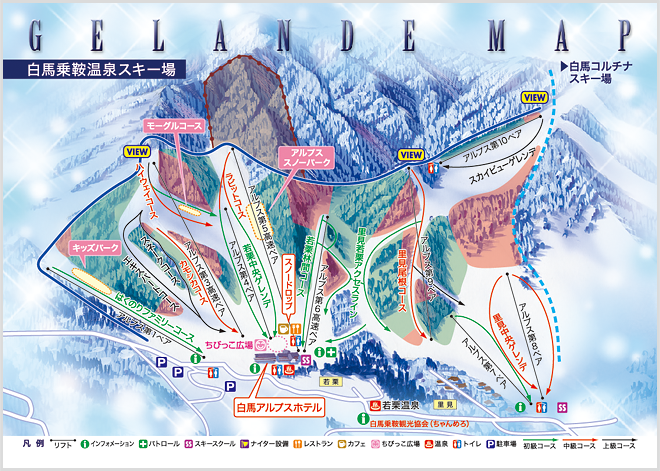 This ski area has 3 big areas, Alps Gelende, Toemi Gelende, and Iimori Gelende. 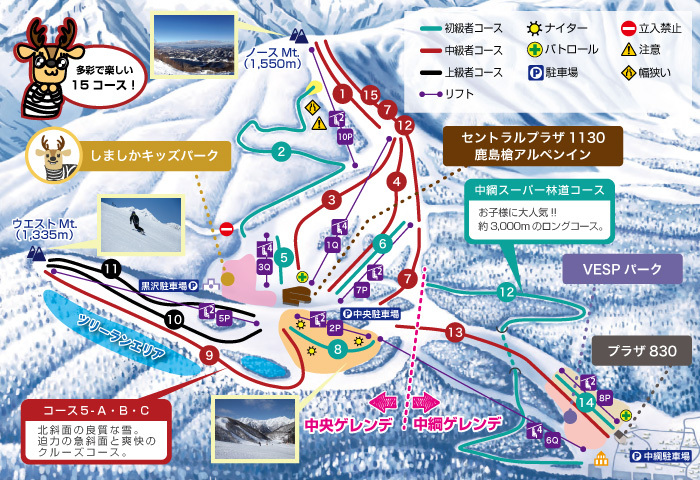 Also can traverse to Hakuba 47 ski area so you can enjoy a full day skiing easily. The Escal Plaza (center house) is amazing. It liturally has everything you need for your ski holiday. Souvenier shops, Burton shop, great range of retauraunts that includes Subway etc… Its just very convenient and great for couples and families who wants to do everything. 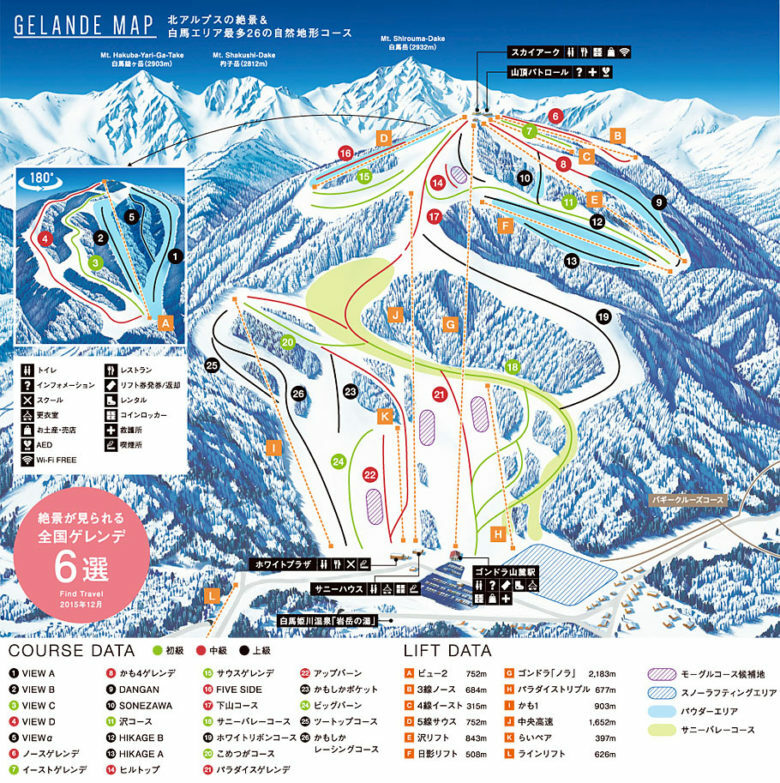 One of the most LOCAL ski areas in Hakuba Valley. Known for its mogul course and great view of Lake Aoki. The area itself if pretty small but the view from the top is facinating. Great for family skiers. Also, you rarly will have to wait for chair lifts, and if you are the one who wants to enjoy quiet run, Sanosaka might be a great option. There are 2 ways to access Kashimayari. One is from Omachi city that will direct to the central gelende, and from Nakatusna Lake side which will be Natatsuna gelende. Most of the people from Hakuba will ride a chair lift from Nakatsuna side. The center house is called the Central Plaza 1130 and it has accomodation, onsen and all sorts of shops inside. If you are traveling with your camping car, they have power supplies at the parking lot for you to use. You can enjoy different view of the Japanese Alps from Kashimayari, so if you get bored in Hakuba area, this is where you want to be. 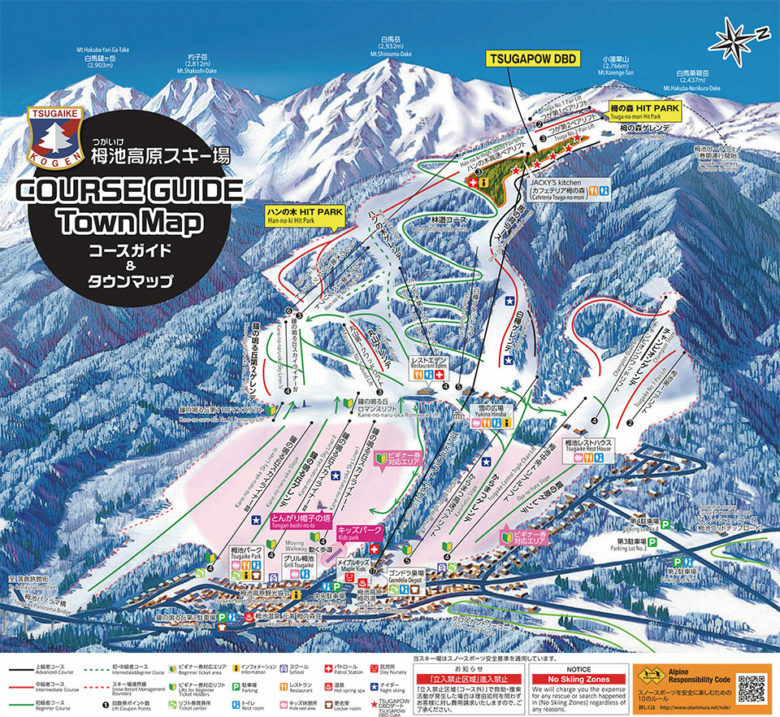 Located the southernmost of Hakuba Valley, easy access, and most of the slopes are pretty gentle. Recommended especially for beginners and kids. So yea, that was it for some brief information about the Hakuba Valley. Every ski area is different, snow condition, staff, food, view, etc… Hope you’ll find your favorite one!!!! 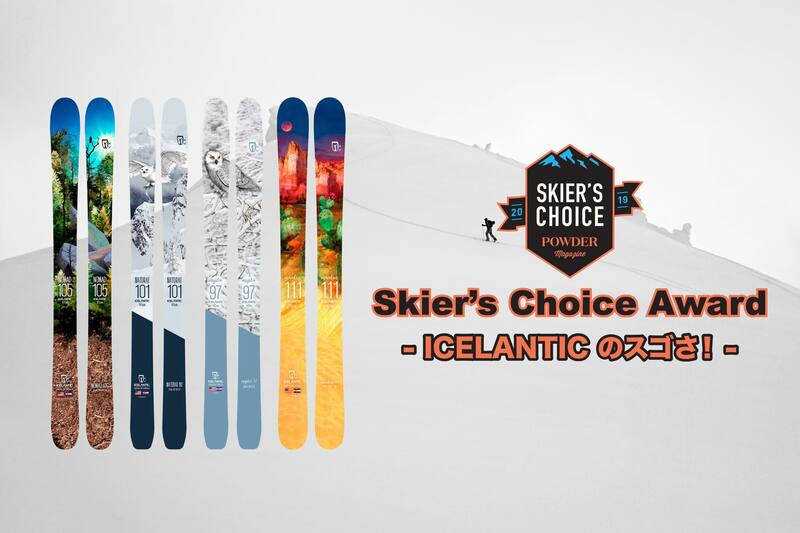 POWDER The Skier’s Magazine の「Skier’s Choice Award」からわかるICELANTICのスゴさ! Copyright © 2018 Icelantic Japan.